This week we are showcasing Technique Tuesday Products. You don’t have to use them for the challenge but if you have them we would love to see them used. 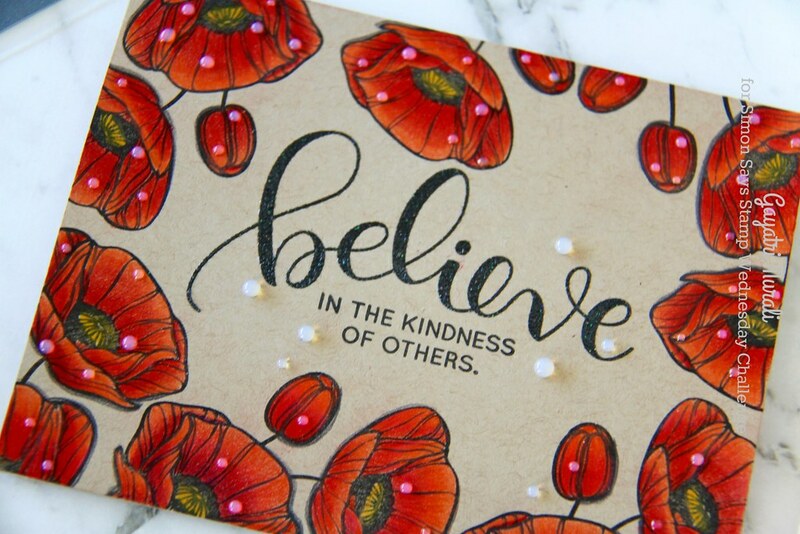 I love the Budding Poppies stamp set from Technique Tuesday. I really wanted to relax so I decided to stamp the poppies and colour them with pencils. I stamped the poppies all around the landscape oriented kraft card base in black. Then I used shades of red Prisma colour pencils to colour the poppies and buds. The centre of the poppies are coloured yellow. I added shading to one side of the flowers and buds using grey coloured pencils. For the sentiment, I used Simon Says Stamp Believe stamp set. 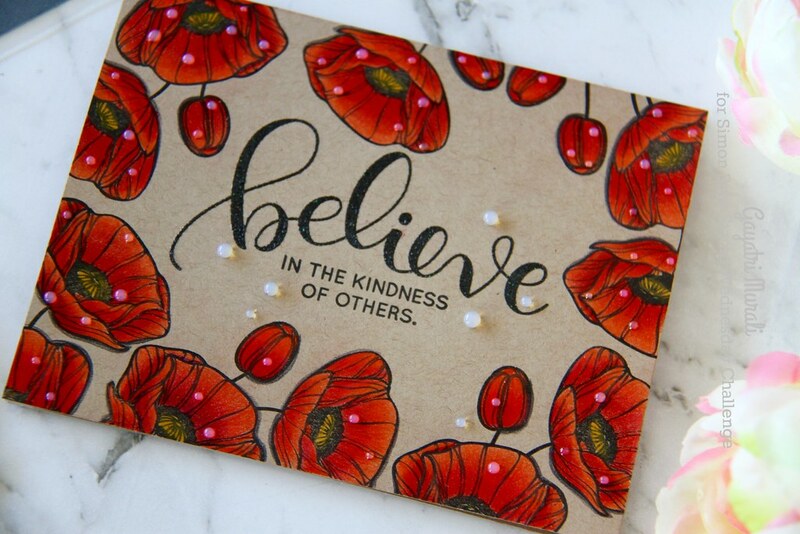 I black heat embossed the big scripty believe at the centre of the card front with the smaller sentiment below the big sentiment. Then I used glossy accent to add dew drops to the flowers and around the sentiment. Sorry I took my photo before the glossy accent drop dried. Because of that they show better on the photo. Hope you like it. All the supplies used to make this card is listed below the post. Thanks for stopping by. Cannot wait to see what you make for the challenge. THIS is amazing! The colors are WOW. 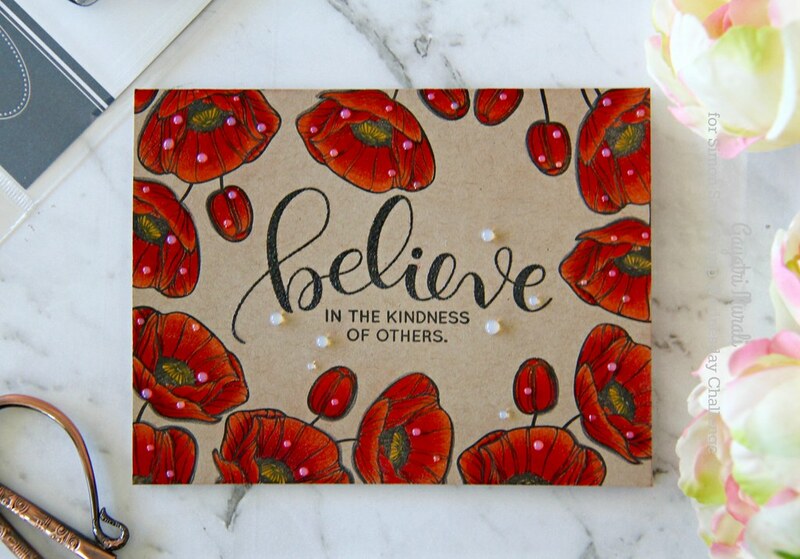 I love the rich, red flowers on kraft and the dew drops with glossy accents looks perfect! This is just stunning! Thats awesome. Like minds huh, Linda 🙂 Thanks for your lovely comment. Gorgeous, Gayatri. The red is so rich on kraft. I have to remember to use kraft. Oh wow, what a card! Your pencil coloring is AMAZING. You really made those flowers shine. LOOOOOVE it! What an amazing card. Your colored pencil coloring is just amazing. I also like the little dots of Glossy Accents all around the card. So pretty! !